I just ordered my first 3d Printer (in time to claim it as a business purchase in my taxes ). It's an Original Prusa i3 MK3. At $800 in kit form (including shipping from the Czech Republic) it's more than what I initially wanted to spend (you can buy cheaper Chinese printers), but it has very good reviews and can handle many materials. No, I have no intention of competing with Relampago. In fact, I'm not planning on making traditional throw tops in the near future. But I'm working on an idea for a spinning toy . I'll also probably print parts to fix some tops in my collection. The future is coming fast! Exciting news! Looking forward to seeing that spintoy, as I'm sure it will be a ton of fun. Also excited that you'll be making top parts -- a subject near and dear to my heart. I'm lucky enough to have a LEGO friend/engineer with a 3D printer and lots of experience. She prints mainly LEGO-compatible parts that mechanically minded builders like me have long clamored for -- including a versatile ring gear for planetary transmissions and various adapters for the powerful motors, servos, and radio receivers used in fancy non-LEGO RC toys. Someday, I'll ask her to print some of the LEGO-compatible top parts I've long clamored for -- including a sturdy one-piece fine tip and mount and a very rigid 12-spoke hub for tops with 3-, 4-, and 6-fold rotational symmetries. Hub and tip flexures are important sources of wobble in LEGO tops, and this kind of wobble can be very hard to eliminate. Solid printer. Let the fun begin. Well, I finally got the printer kit 2 weeks ago (after crossing the Atlantic 3 times due to a misunderstanding ) and assembled it last weekend. I printed a few trial pieces this week in PLA and the results were impressive. Some interlocked gears printed at 150 micron layers spin smoothly and a little frog I printed at the maximum layer resolution of 50 microns (but standard nozzle) has a finish almost looks machined not 3D printed. 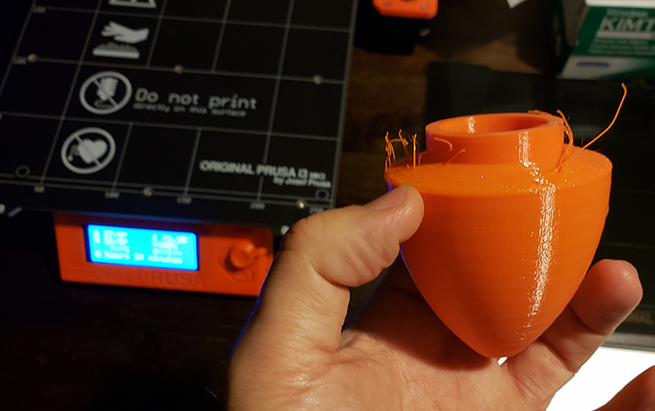 While it was printing I was thinking the top had too much plastic and it was going to be too heavy, but that is not the case. It plays great! It's also very well balanced, in spite of the hairs I cut. Great job by Jose and also Josef Prusa! I have been making tops for eight years and still learning - and having FUN. You have a metal lathe? Make some tips. Very nice! Looking forward to seeing what else you come up with. It is indeed a nice print!!! Is it woobly with the plastic tip ? Not at all. I took that photo with the phone on my left hand while the top spun on the fingernail of my right thumb . . .
By the way, I used 200 micron layers, solid fill, and it took a little over 6 hours to print. Yep mine is definitively not that great But that's amazing!!! Cheers! Happy new year to ta0. You will have lots and lots of interesting adventures with that printer. Congratulations!!! Good work. I'm not planning on making traditional throw tops in the near future. But I'm working on an idea for a spinning toy. I think you're in for a lot of fun. Shapes and structures you can turn on a lathe occupy only a small corner of spintoy design space.